Often times, people with any type of arthritis tend to have a lot of “structural” issues in their body, in addition to pain and inflammation of the joints. In addition to the back being commonly affected – whether from arthritis directly or indirectly – the feet often tend to develop issues, as well. The Arthritis Foundation says, “Feet are the whipping boys of the body. With every mile we walk, 200,000 to 300,000 pounds of stress bears down on our tootsies, and by the time we’re 50, most of us have walked 75,000 miles. That’s a lot of action for two narrow islands of 26 bones and more than 30 joints. And yet despite the central role feet play in our lives, most of us ignore them. We begin to lose flexibility and elasticity, and our shock absorbers simply don’t work as well as they used to. Add arthritis, and you have a double whammy. Joints inflamed and distorted by arthritis find no comfort from a day’s pounding in ill-fitting shoes or from feet whose padding has grown thin. Gout, for example, often affects the feet. According to Foot.com, “Gout is another form of arthritis that also leads to foot complications. Excess uric acid crystals collect in and around the joints of the big toe. The big toe joint is commonly the focal point due to the stress and pressure it experiences during walking and other weight bearing activities. This often leads to severe pain in the big toe. Men are more likely to develop gouty arthritis than women.” TackleGout.com has further info about gout – what it is, how it affects you, and how to treat it. Rheumatoid arthritis sometimes starts in the smaller joints of the hands and — you guessed it! — the feet or ankles. As you know, “rheumatoid arthritis is not an isolated disease of the bones and joints. It affects tissues throughout the body, causing damage to the blood vessels, nerves, and tendons. Deformities of the hands and feet are the more obvious signs of RA. In about 20% of patients, foot and ankle symptoms are the first signs of the disease,” says OrthoInfo.com. Osteoarthritis affects the feet, too. Everyday Health says, “according to the Arthritis Foundation, close to half of people in their sixties and seventies suffer from arthritis foot pain. In fact, the damage starts even sooner: Beginning in your forties, your feet begin to show wear and tear, explains Dennis Frisch, DPM, a Boca Raton, Fla.-based podiatrist. Osteoarthritis, the most common kind of arthritis, occurs over time and by overuse. The cartilage between the bones at your pivotal joints wears away. As a result, your bones grind against each other, causing pain and swelling. Very often osteoarthritis also causes degeneration of the cartilage at the base of your big toe. Bony spurs then develop at the joint there, followed by pain and decreased motion of the joint. Visit both a rheumatologist and a podiatrist at LEAST once a year. Also, make sure that your shoes fit properly! Stretch your feet and your Achilles tendon before and after any physical activity, and throughout the day. Try reflexology or a foot massage. Try a cane, walker, or brace if need be. Try a product such as “Yoga Toes” that stretches out the toes while strengthening and enhancing flexibility. Elevate and ice your foot if it is swollen. Soak your feet in a hot bath or tub. Consider toe straighteners, gel toe caps, or gel pads for inside your shoes. Try medications, supplements, or ointments that your doctor recommends. Try a paraffin wax dip. Ask your doctor if physical therapy would be beneficial for you. 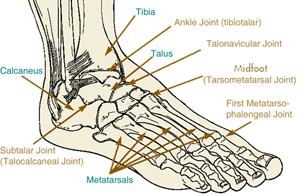 Bear in mind that there are 28 bones and more than 30 joints in the foot. Tough bands of tissue, called ligaments, keep the bones and joints in place. If arthritis develops in one or more of these joints, balance and walking may be affected — so make sure that you are walking correctly, stretching, getting enough exercise, and wearing the right shoes. Make sure to always ask your doctor before starting any new treatment. Sometimes, surgery is necessary, and sometimes, foot pain isn’t arthritis: it may be a congenital structural problem, an old (or new!) injury, or just common foot aches and pains from overuse. Regardless, it is important that if you have foot issues, that your rheumatologist addresses them, or that he/she refers you to a trusted podiatrist. Good luck – and check out an old blog post I did on shoes and foot health, on Happy Feet Today’s foot health blog, here. You can also learn more at Foot.com and Arthritis.org! Tags: Arthritis, Arthritis Ashley, Arthritis Blog, Arthritis Foundation, arthritis of the foot, Ashley Boynes-Shuck, chronic pain, feet, foot health, foot pain, foot problems, foot surgery, Gout, happy feet insoles, happy feet today, Health, Human Body, Mid Atlantic AF, Mid Atlantic Region, orthotics, Osteoarthritis, pain, physical therapy, podiatrist, podiatry, Rheum, Rheumatoid Arthritis, rheumatologist, rheumatology, shoes, sore feet, Tackle Gout, tacklegout, Wellness, Wellness with a Side of Life. Bookmark the permalink. Previous post ← Digital Rheum: Massage Envy Healing Hands for Arthritis is back for 2012! Hey there, You have done an excellent job. I’ll certainly digg it and individually recommend to my friends. My son has arthritis in his foot and has recently started playing football in school. I’m trying to find ways to manage the pain on and off the field. Are there any suggestions you can recommend I do to alleviate the pain?